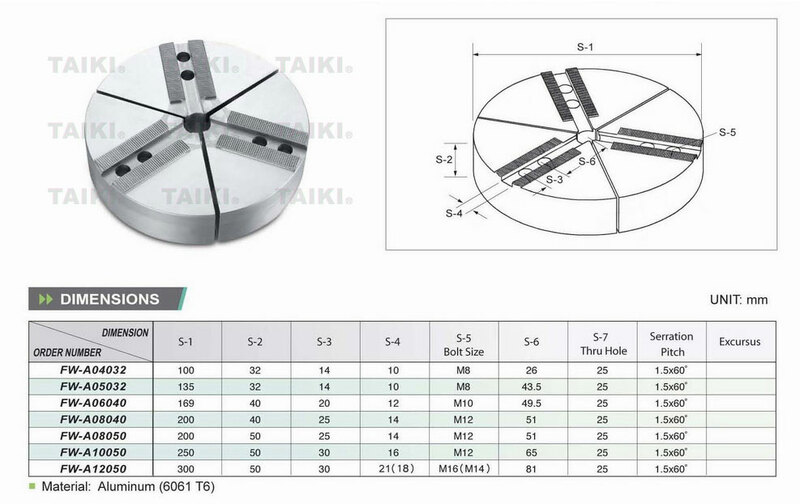 Aluminum Round Jaws(FW-A10050) - Taiki Industrial Co., Ltd. The aluminum round jaws(FW-A10050) are suitable for extra bigger outer dia. (thin pipe.). This type of round jaws can cover the outer dia. of work piece enable to decrease deformation and increase the accuracy. For example: Type of FW08 can hold parts with outer dia. of 200mm. For detailed specification, please download PDF. No change shape of work piece. Your work piece will not be broken. Your work piece will not have any scrape. The Aluminum Round Jaws are used on light pressure cutting, and are suitable for the work piece of thickness thinner, or thin tubule.